The Camellia is one of the first signs of spring in my garden. I have a red blooming variety that faces west in a shady spot by my back gate, so it typically blooms a little later than some of the others in my neighborhood. I love the compact little blooms and waxy dark green leaves and I often bring them in to “float” in a big glass bowl for some early spring color. 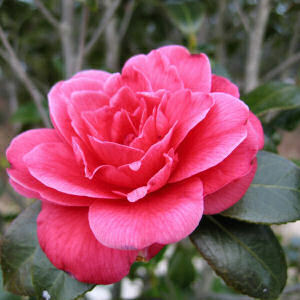 The Camellia is native to eastern and southern Asia and is an evergreen tree or small shrub. The leaves are dark green and glossy and the flowers are large and conspicuous. The Camellia tends to love our acidic Northwest soil and high rainfall. I used to work at Wizards of the Coast here in Seattle on the “ Magic: The Gathering “ brand. One of the Magic novel characters “Kiku, Night’s Flower” is an assassin who uses magically enhanced purple camellias to kill her foes. Of course in the real world Camellias are NOT poisonous. I also just read about Camellias in Muriel Barberry’s novel (translated from French) The Elegance of the Hedgehog. They were used as a motif in this novel which I read with my book club. It got me thinking about my Camellia which remains hidden in a corner of the yard and I ventured out to take a look – lots of buds but no bright red flowers yet. Another quite interesting Camellia factoid - Queen Elizabeth grew Camellias in all of her gardens. In fact when she died one of the Camellias from her gardens was placed on top of her flag-draped coffin. Believe it or not there is an American Camellia society http://www.camellias-acs.com/ devoted to growing and propagating camellias of all types and sponsors the annual Camellia festival at Massee Gardens, near Fort Valley Georgia in February. There is even an International Camellia society http://www.camellia-ics.org/ that publishes The International Camellia Journal and has over 2000 members worldwide. Who knew!? I hope you live in an area where the Camellia shows off for you and is a portent of happy gardening this early spring! my 6 yr old ran into my room this morning telling me that there are red flowers on the trees outside!! &quot;big red flowers! !&quot; he kept saying it over and over. I had no idea he would get so excited about our camellia :) <br/> <br/>There are more societies out there that you can even imagine! gotta love the gardeners of the world. Total maniacs! <br/> <br/>Thanks for the post! Nice post about Camelias! We had a bunch of 40 year old camelias planted too close to the foundation so we mowed them all down; but I miss their blooms about this time of year... need to replant a couple of them for sure. Thanks for sharing!